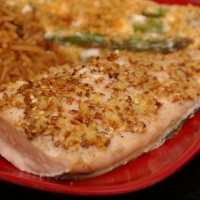 This zesty version of Mahi Mahi is a delightful yet flavorful aray of goodness. Preheat oven to 400 degrees. Coat a shallow baking dish with non stick cooking spray. Place sesame seeds in small skillet and place over medium heat. Cook, stirring occasionally, 2 to 4 minutes or just until golden and toasted. Remove from heat, cool slightly. Pat fish dry with paper towels. Drizzle or brush sesame oil on fillets, sprinkle evenly with garlic pepper, ginger and sesame seeds, pressing to coat. Place fillets, in baking dish. Bake 10 to 15 minutes until fish flakes easily with a fork. This sounds great I love mahi mahi prepared this way. Like mis7up's recipes? Never miss an upload!